A lot of travelers think of Maine as a seasonal destination. Nothing could be farther from the truth for the Southern Maine Coast. A thriving year around small business community shores up the Kennebunk’s, making them a year around destination. Here’s an overview of what to expect to find anytime of year. If you live within an hour or two drive of Kennebunkport, January is a great time to escape for a couple of days to rest and recover from a busy holiday season. It’s cold this time of year, but a bracing walk along one of our deserted beaches is a great way to enjoy our coastline in another season. And we even have surfers year around! February isn’t just about Valentine’s Day. We celebrate lovers all month long with the local businesses offering specials geared for you and your special someone. We literally paint the town red! Enjoy the spectacular outdoor lighting and decorating. March and April are still very much winter months up here. So a couple of days in front of the fire with a hot drink (or a glass of wine) and a lobster roll to hold you over to the summer months is a perfect way to escape the cold. May and June finds the weather warming up and all of the gardens are starting to come alive. The shops and restaurants that do shutter for the winter months open up again as Kennebunkport springs back to life (see what we did there?!). 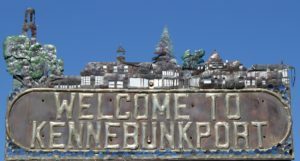 June is also for the Kennebunkport Festival that runs June 3rd – 9th, 2019 and is a celebration of food, drink and all things Maine. The Historic Inns of Kennebunkport will be hosting their annual Garden Parties on June 8th, 2019 for our guests only. Things sell out quickly so make your reservations now! The summer season kicks in during July and August and things get really busy those two months. The beaches are in full swing and all of the restaurants are open. If you’re planning on joining us, make your accommodation bookings early and let us make dinner reservations for you too. We highly recommend your trip to the Kennebunk’s this time of year include some time on the water. The Schooner Eleanor offers lovely sails along the coastline. If you fancy something more “educational” join Capt Bob and his crew on the Rugosa Lobster Boat. 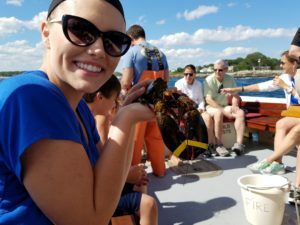 Fabulous way to learn about one of our most important Maine industries while enjoying the ocean. September has become our favorite month to be in Maine. The crowds die down a little, the weather is good and everything is still open. As we move into October the leaf peepers start arriving. Maine is a particularly beautiful state in the autumn as the trees begin to show their color. Peak viewing is usually around the middle of the month in Kennebunkport, but there’s color out there to enjoy anytime. Evenings begin to get a little chilly and some of the seasonal restaurants begin to close towards the end of the month. As the autumn season comes to an end, November brings with it a quieter time as we get ready to ring in the holidays. Christmas Prelude is celebrated the first two weekends in December and we’re all things Christmas then! Santa on the lobster boat, tree lighting, fireworks, caroling, craft fairs and a whole lot more. If you haven’t been, book your Inn accommodations early as many plan a year in advance to attend. Whatever time of year, the 1802 House Bed and Breakfast can help you ensure you get the most of your Maine visit. Give us a call if you have any questions or need help planning your stay. Hope to see you soon!